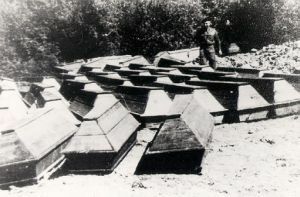 In May 1946 the buried bodies were exhumed on command of the military government. 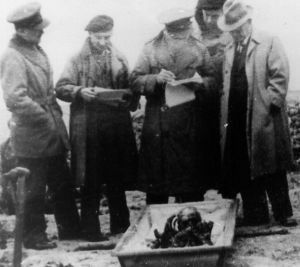 German prisoners of war and employees of the Braunschweig firms Büssing and Luther dug at the estimated locations and found the bodies buried 1.5 metres deep. The skeletons of 113 dead were placed in coffins and buried at a new cemetry. In July 1954 they had to be reburied again. A war crimes trial started at the military court in Braunschweig on 2. January 1947. Three high ranking officials from the Steinöl firm, Prof. Wittig, Dr. Hefter, Hans Ohlen and men employed as guards were put on trial for unjust treatment of allied citizens. The men were: Friedrich Ebsen, Carl Truschel, Erich Arnold Jahn, Johann Heitz, Arthur Große, Herbert Schiefelbein. The local press reported daily, reminding its readers of the attrocities which were committed in the Concentration Camp. On 3. March 1947 the court pronounced judgement. The death penalty was placed on Wittig, Ebsen, Truschel, Heitz and Grosse. Hefter and Jahn were let off. Ohlen was sentenced to imprisonment for 10 years and Schiefelbein to 2 years imprisonment. Ohlen’s sentence was shortened to 7 years. Ebsen, Große, Truschel and Heitz were hanged on 2. May 1947 at the prison in Hameln. Hartmann, a Steinöl employee, told the court how Ebsen sometimes held lectures and referred to the prisoners as being the phlegm of human kind and to be treated as such. 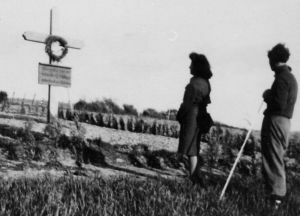 Eugéne Marion, a member of the French Maquis resistant movement, was arrested in April 1944 and was one of the first prisoners in Schandelah. He reported about Ebsen: One Sunday afternoon he made all prisoners line up to watch the punishment of two men. Ebsen whipped them 25 times. Normally such a punishment was carried out by Kapos. The witness Leon Claude told how Ebsen attacked an eighteen year old Belgian prisoner after his arrest with his fist and then with a 4 cm thick stick which he used to hit him in the face and about his head. The victim collapsed drenched in blood and died the following day without regaining consciousness. Marion stole and hid a driving belt on order to sabotage the camp. Hans Spinnrad, the oldest camp member, mistreated him for a whole day because of this. Marion had to bend over a bench and Spinnrad beat him with a rubber hose. If he fell off the bench Spinnrad kicked him in the back. Eugéne Marion also remembered more human behaviour. He worked from time to time outside the camp with a group of army pioneers who worked on trial borings. Hermann Fleck was in charge of this group. He gave Marion bread every day and 3 or four potatoes every week. He was allowed to fry them and share them with comrades. Marion described the pioneer kommandos as good people who did not come into contact with the other prisoners.